Modern Bible Versions Are Dangerous! This is neither a translation nor a version - it is a paraphrase. The Living Bible, praised by Billy Graham and other New Evangelical leaders, has reached a publication figure of 37 million copies and has made its author, Ken Taylor, a wealthy man. It is very readable, but at the expense of truth in so many places. Taylor admits that the principle he worked from was not a "word-for-word" translation but rather a "thought-for-thought" paraphrase which he called, "dynamic equivalence." Taylor said he worked for the most part from the ASV of 1901, a corrupt translation to begin with. 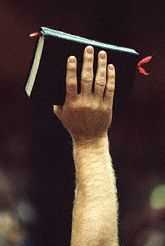 The NASV was to be the Bible for conservatives, Evangelicals and Fundamentalists. The foreword states that the NASV "has been produced with the conviction that the words of Scripture as originally penned in the Hebrew and Greek were inspired of God." The basic problem with this translation, however, is revealed in this statement: "This translation follows the principles used in the American Standard Version 1901 known as the Rock of Biblical Honesty." Who gave the ASV such a title? In the Principles of Revision, it is stated: "In revising the ASV consideration was given to the latest available manuscripts with a view to determining the best Greek text. In most instances the 23rd edition of the Nestle Greek New Testament was followed." This gets right to the heart of the major problem with the modern Bible versions - most are patterned after the corrupted Westcott-Hort Greek Text rather than the Textus Receptus. Like the NASV, the NIV was produced by those who are said to "hold a high view of Scripture." Sponsored by the New York Bible Society, they admitted the NIV translators represent a "broad spectrum in evangelical Christianity" and the list of names confirms the broadness of the spectrum. Instead of being a revision of a previous version, the preface says, "It is a completely new translation made by many scholars working directly from the Greek." The Greek text used is an "eclectic one." that is, the translators mixed different texts supposedly in "accord with sound principles of textual criticism." However, they did not state what those principles were - and much of the previous undermining of the Scripture has been done on the supposed basis of "sound principles of textual criticism." Examining the text, you find that the NIV leaves out many of the same verses and portions that the ASV and the NASV also omit. An added problem, however, stems from the fact that where an entire verse is omitted, even the verse number is missing and only a small letter refers to a footnote of explanation. A careful study of this version confirms what one Christian leader said several years ago, "For every verse or word clarified in these new translations, two new problems are created." We agree with his statement. In a critique of the New International Version, one Fundamentalist scholar correctly objected that "words were dropped out; words were added; and key words were sometimes changed." Yet, the same objection must also be raised concerning the New American Standard Version which this same Fundamentalist scholar defends and recommends. This objection - the deletion or addition of words-also applies to all the other modern versions. We still insist on using and recommending only the Authorized Version. 2 Peter 3:2 tells us that if we want to know God's Word, then we are to look nowhere other than to the "words which were spoken before by the holy prophets [O. T. Scripture], and of the commandments of us the apostles of the Lord and Saviour [N.T. Scripture]." God's Word provides us with all we need to be built up in the faith and to do God's will and work - God gave no additional revelation once the Bible was completed. The inspired writings of the apostles, circulated among the churches and later canonized, were perfect and complete (Lk. 1: 1-4; 1 Cor. 14:37; Eph. 3:1-7; 1 Thess. 2:13; Rev. 22:18, 19). The internal evidence of the Word of God states without equivocation that believers today have a final authority - God's Written Word.